l Complete range of solenoid valves for refrigeration, freezing and air conditioning plant. l Supplied both normally closed (NC) and normally open (NO) with de-energized coils. l Wide choices of coils for a.c. and d.c..
l Suitable for all fluorinated refrigerants. l Temperature of medium -25°--105°C. l FDF is also available with flange connections. 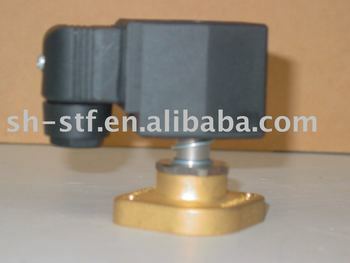 FDF-BFDF-Z series solenoid valve is the direct-acting type. The pull of the solenoid coil opens the valve port directly by lifting the seat disc off the valve seat.While de-energized in the coil,plug stem will drop and close the valve port because of spring force and its weight. FDF-M series solenoid valve is pilot type valve. While energized in coil,the coil emerges magnetic field and pick up plug stem,open the small orifice.Then the pressure in the upside of valve reduced, the pressure difference between both side of diaphragm happen,cause the diaphragm lift to open the main orifice. While de-energized in the coil,plug stem will drop and close the small orifice because of spring force and its weight.The flow medium enter into upside of diaphragm through throttle hole,then pressure in both side of diaphragm,balances,then the diaphragm drop and close the main orifice.